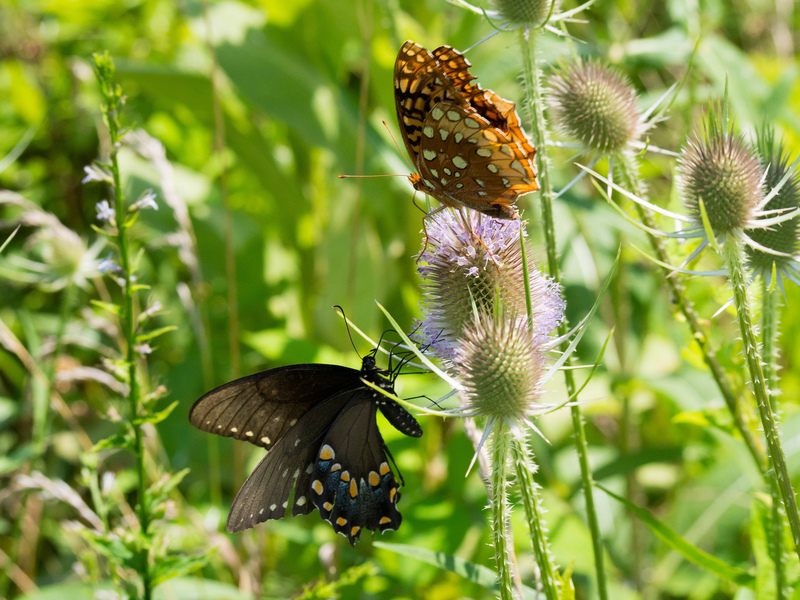 Butterflies at the Mckee-Beshers WMA in Poolesville, MD. The greater DC area is currently in the throes of some hot and humid weather – that is, it’s summer. Much of this summer has been rainy, though; we got about a foot of rain in June alone. So any chance to get outside has been welcomed, even if it has been hot. I’ll get to Harpers Ferry in a minute, but first, sunflowers. Today we walked around a bit at the McKee-Beshers Wildlife Management Area in Poolesville, MD. We were on the hunt for sunflowers. A former student of mine had posted a photo of them online about two weeks ago, and yesterday I learned that these fields stay in bloom just about two weeks, so off we went. 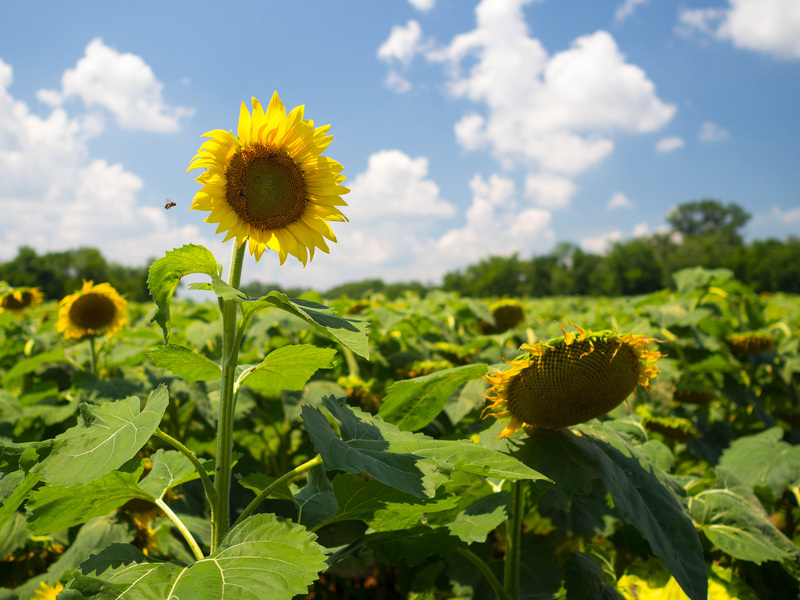 I’ve also seen the area discussed on local online media lately, and indeed, many people we passed on the trails or in parking areas were also looking for sunflowers. By this afternoon, most flowers’ heads were facing downward, and while I know this is likely just because they’ve been in bloom for a couple of weeks already, I like to imagine that in today’s heat – which felt like 100 degrees – they were simply trying to stay cool. Some look up, some look down. Fast forward several years, and Harpers Ferry, while enjoyable to visit for a variety of reasons, is probably the main way I gauge how in shape I am. The first time I ever did this hike, which NPS claims is just over six miles round trip, I was huffing and puffing only a short way up the hill on the way to Overlook Cliff. Since then, things have improved (I’m in better shape, but also hiking poles are incredibly useful on this hike. I rarely see anyone else using them, but they make a huge difference). This time, we included the Stone Fort trail in our hike, a steep uphill to the site of a Civil War fort. The sign posted at the start of the Stone Fort trail says it will take 3 hours to complete; we did it in a hurry, taking only an hour, in part to test ourselves, but also because we had to be in DC for dinner at 7 pm, and we’d gotten a late start to our day. There is really no way to show how steep this section of the Stone Fort trail is. Suffice it to say, I often feel like I’m walking with my body near parallel to the ground (probably an exaggeration). 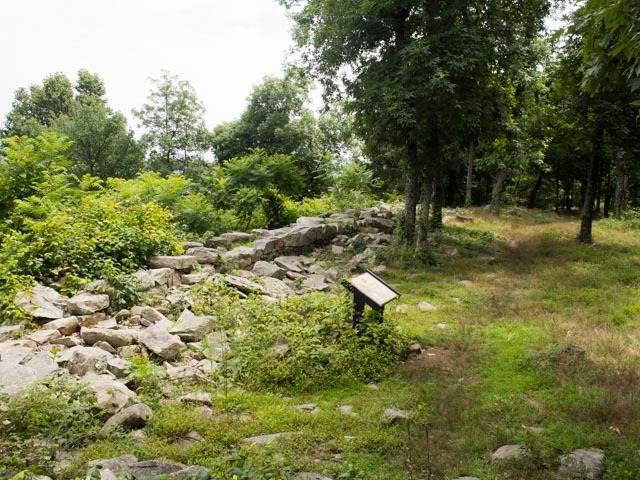 A sign along the way claims that Lincoln, who had intended to pay a visit to his soldiers’ fort at the top of the hill, turned around partway, unable to complete the strenuous hike. I sometimes wonder if this sign is fabricated, meant only to make weary hikers feel better about themselves. I would say the two best parts of the Maryland Heights trail are its endpoints. 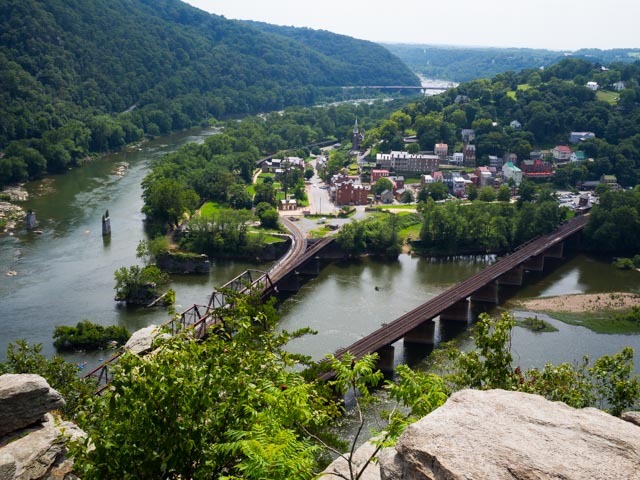 One is in the historic town of Harpers Ferry, where there is far more to do than hike. You can see historic exhibits, go to small, but interesting museums, visit John Browne’s Fort and learn about his raid, and sample fabulous ice cream from a variety of vendors. You can also have a full meal at one of several restaurants, or shop at one of the town’s many stores. Of course, there are also short hikes and great overlooks in the town. If you’re inclined (haha) to go on a short but steep walk, you can head up to Jefferson Rock for a scene Jefferson said was worth travelling across the Atlantic for (it is great scenery, but if you easily become motion sick like I do, you may find his claim a bit extreme). 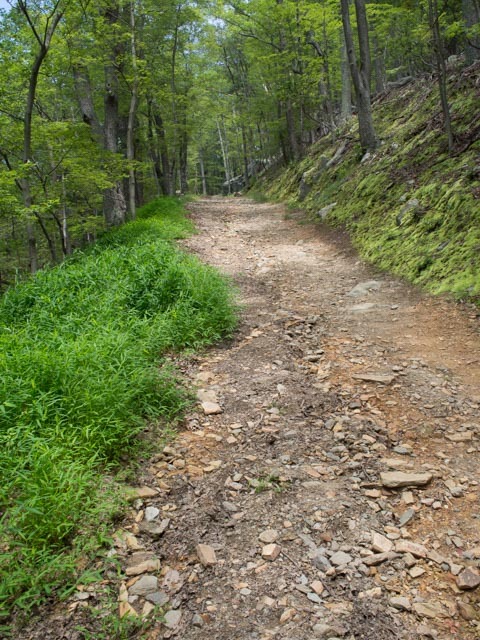 As a side note, the Appalachian Trail also passes alongside Jefferson Rock, and it’s not uncommon to see through-hikers in town. The view from Jefferson Rock on a hazy May day, 2013. 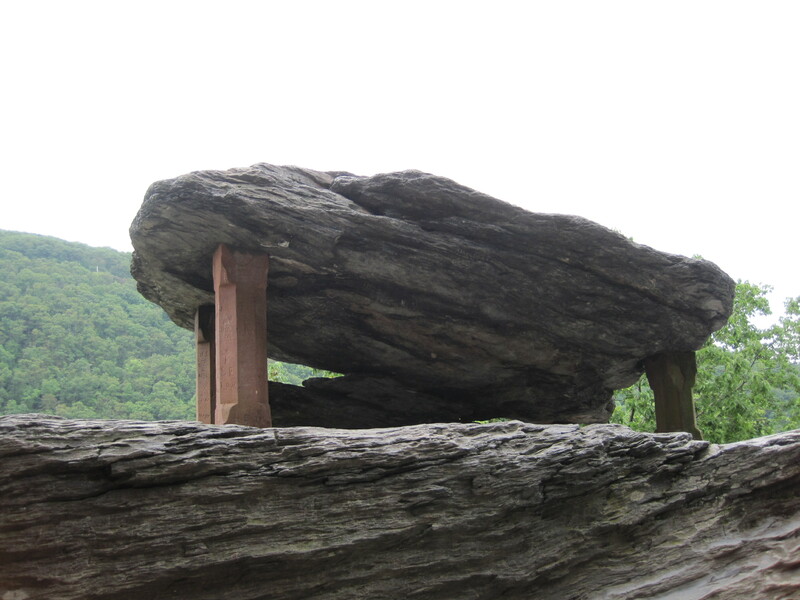 The other endpoint of Maryland Heights is the loftier one—Overlook Cliff. 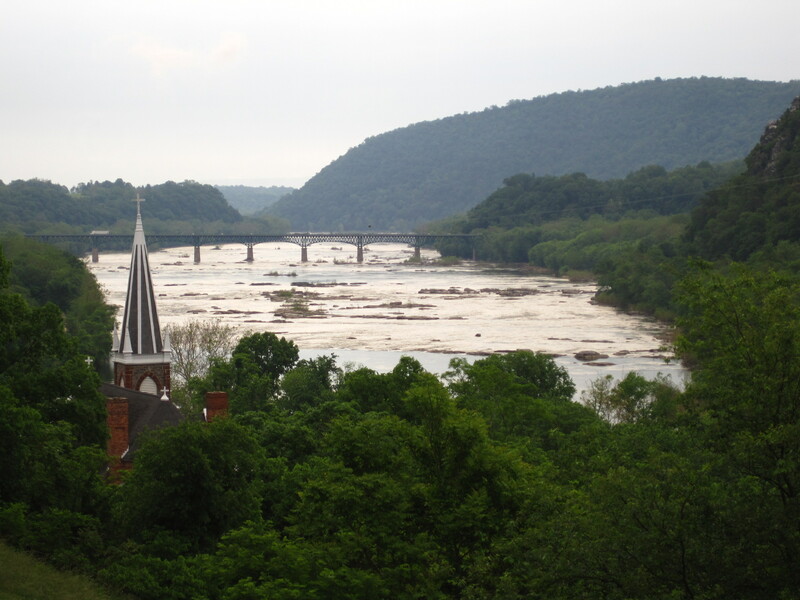 This has got to be the quintessential “view” of Harpers Ferry (sorry, Jefferson!). It overlooks the town, highlights the meeting of the Potomac and Shenandoah rivers, and extends out to the Blue Ridge Mountains. The view from Overlook Cliff. It’s a great stop for a rest, for lunch, for photos, or for simply taking in the views.It’s particularly spectacular in autumn. Many hikers were out a week ago in spite of the heat. I enjoy places that provide good hiking opportunities and are also steeped in local history. I suppose you could argue that any place has the potential to tell you about itself, but some just do it better than others. 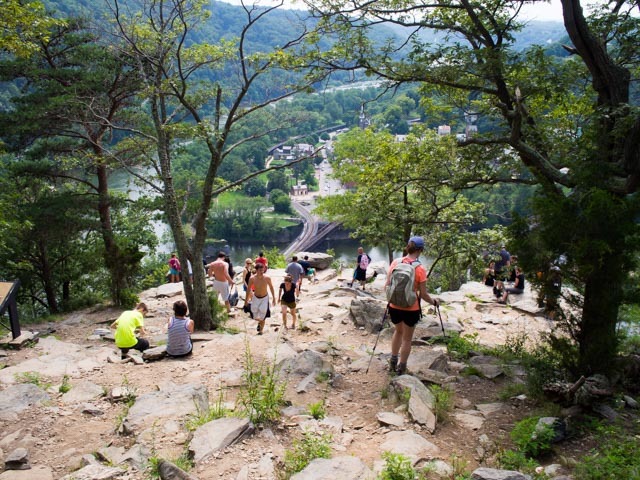 The fact that Harpers Ferry is a National Historical Park certainly doesn’t hurt the cause. It’s interesting to see how nature intersects with human activity, especially previous human activity that manifests in pieces of stone walls, ruins of buildings, etchings in rock. It’s hard to imagine the logistics of having a fort at the top of Stone Fort trail, painful to imagine lugging artillery up there. And to think that in 150 years, nature has mostly reclaimed the area, with only those sections of stone walls remaining. A section of the Civil War fort. There is, to be sure, an ebb and flow to the nature-man balance. If during the Civil War man conquered that hill, so to speak, by now it has fallen back into nature’s hands. I appreciate the way that parks like Harpers Ferry actively seek to maintain a balance between the natural environment and human concerns of the past, present, and future. It not only makes my visits more enjoyable but also ensures that all who visit have the opportunity for a meaningful experience. A tip if you visit the park: A shuttle, complimentary with park admission, runs continuously between the Visitor Center and Main Town. A tip if you like water more than hikes and towns: Tubing and rafting outfitters offer the opportunity for a relaxing float on the Shenandoah River.